Today is the birthday of petzipellepingo, Our Lady of the Library and fangirl extraordinaire. The steady stream of information and encouragement that she provides on a daily basis is an invaluable resource to her flist, and I'm grateful to be a recipient of both. (Honestly--lately, it seems that everything I know, I learned from her!) 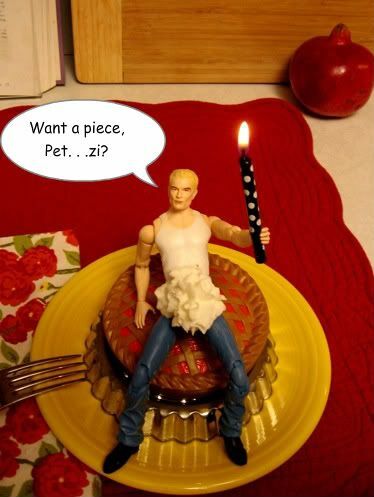 Mindful that Thanksgiving is fast approaching, I would like to make a seasonally appropriate birthday offering. Petzi always manages to find the most amazing cakes for her birthday posts, so no way was I gonna try anything cake-related. *bows to her cake supremacy* However, it occurred to me that she might be in the mood for something a little different. . .
Ah, nothing to start off the ol' birthday like pie, terrible puns on one's username, and a proposition from a plastic vampire. *worried* Right? Current Music:"let's have another cup of coffee"
Happy birthday to Petzi and happy holiday to you and yours! Heee! I love "crusty reprobate foundation." And d'oh! This is why I shouldn't make these things late at night; I was so fixated on the pie idea that the many opportunities presented by the word tart eluded my tired brain. *vows* Another time! Thanks, Reb! Y'all have a lovely day as well. Thanksgiving: A ritual animal sacrifice. With pie. 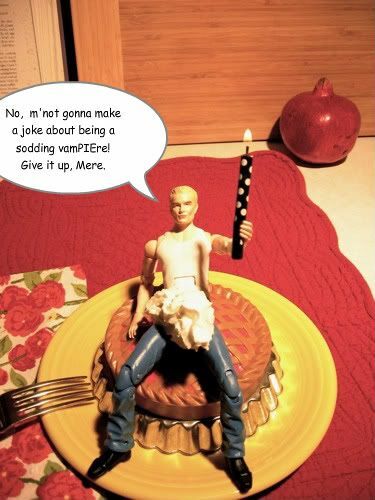 Dr. Horrible also rocks the pie metaphor, to which I was alluding. In short, you can never go wrong with pie. Oh dear, it appears that Spike got himself a little too overexcited about those birthday wishes "cough, snorfle, cough - eyes Spike's jeans - cough, snorfle, cough". And thank you O Queen of the Spaiku and the Picspam for the good wishes, may you have a wonderful day - with no housecleaning - as well. And doll!Spike, bless his little heart, did his best to keep me from making puns even worse than the one I actually posted . . .
Aw, you're very welcome, and I hope you're having great day! Glad that you enjoyed the little slice of vamPIEre. *facepalm* Okay, that's an awful pun, even for me! We're lucky to have you and your cadre of abused action figures. Aww, you're such a sweetheart. *hugs* I'm lucky to have a group of people in my life who will reward my depravity! So. Why is Buffy not in this photo shoot?! Lord knows the girl could use a snack. I'm so going to regret this comment in the morning. Which is why I'm answering it right now before you sober up delete it in a fit of poster's remorse! Um, technically, I creamed Spike's jeans, and wow, that looks even worse somehow. Buffy was out at Walgreen's refilling her iron prescription. Also, she's PMSing in a major way and totally over his tartiness this week. Or is that his tardiness? Possibly both. They think it, I say it. *pops the Champagne for Petzi* That's what I'm talking about! Somehow the PMSing opens up new avenues of depravity in the world of Spike 'n candle. How you doin? I chuckle over the tardiness/tartiness. I chuckle and fall off this chair. The benadryl/dregs of wine is a lethal combo. Bwah! The combo of the Palin wink and the Tribbiani charm is truly frightening. *dials cell* Take the long way home, Buffy doll! It's not safe for you here, darling! Upsy-daisy, my kitchen-weary amiga. You must save your strength for the trussing and the stuffing and the I know not what all of tomorrow's culinary trials. *hugs* To bed with you!